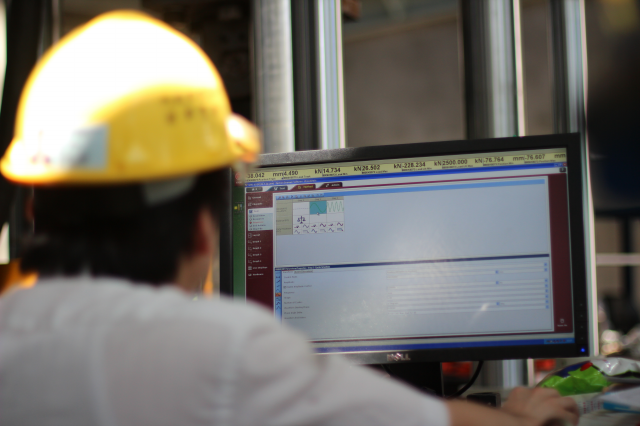 All FVD products are produced under strict quality control systems that meet global and local standards for manufacturing management and quality assurance. 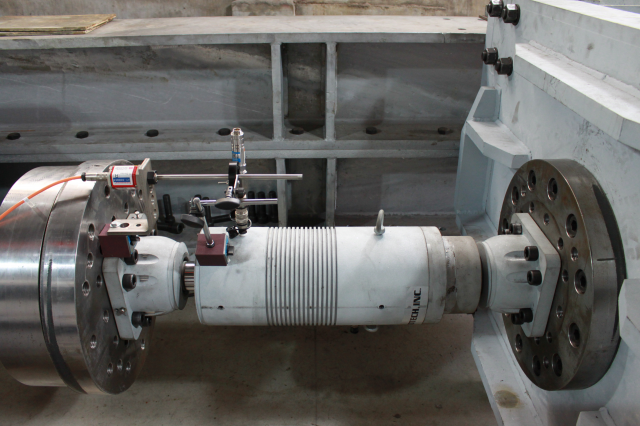 Fluid viscous damper (FVD) products all passed TAF laboratory's object and performance assurance test. All products provide warranty certificate that include serial number and test results of the product. Sinotech Inc. provides 15 years limited warranty. 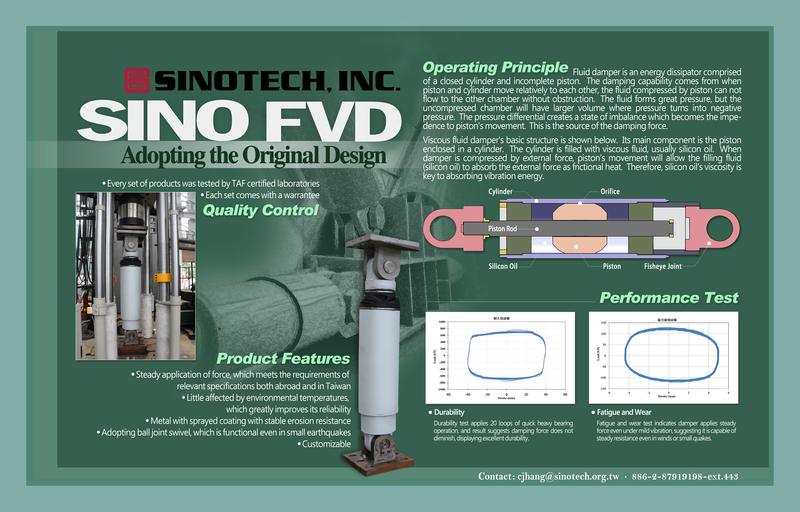 Sinotech FVD products offer significant damping ratio increase and seismic stress reduction in any structure against earthquake and wind. High performance: operation meets design theory, and the variability is far lower than the required specifications. High stability: structure and assembly are high quality, and no maintenance or replacement required during its lifespan. 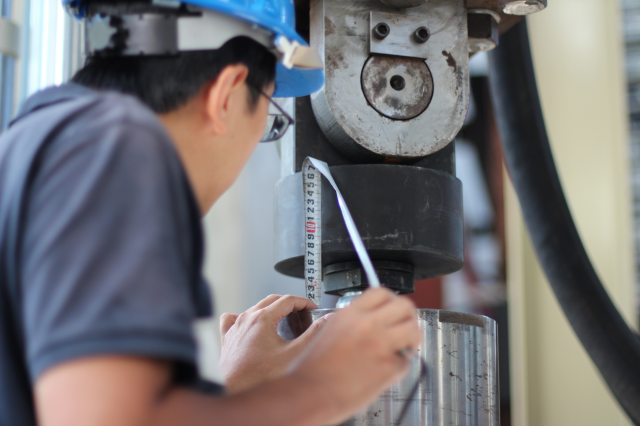 Shock absorption: easy installment, quickly achieving the goal of structural damping or reinforcement. 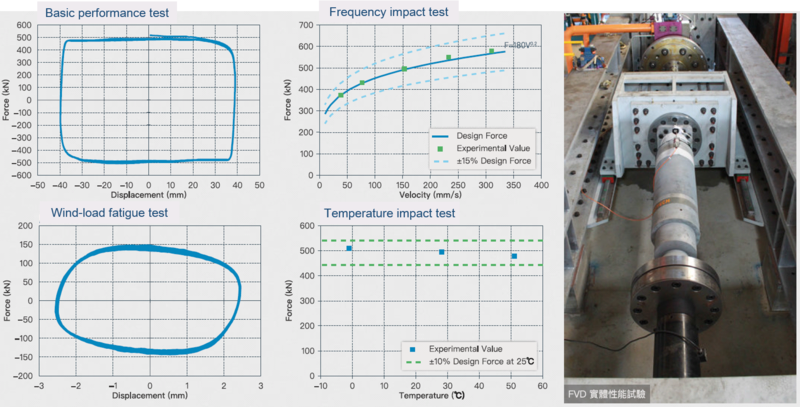 Analysis benefit: damping force has clear dynamic equation, allowing easy dynamic simulation analysis. 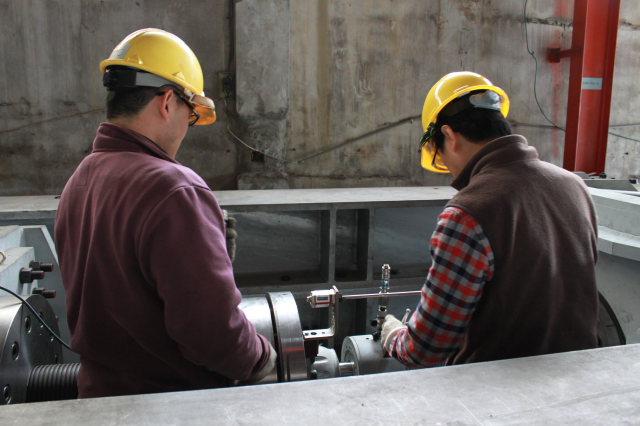 Fluid viscous damper (FVD) products all passed TAF laboratory's object and performance assurance test, exceeding both Taiwanese and international specifications and demonstrating designing excellence. 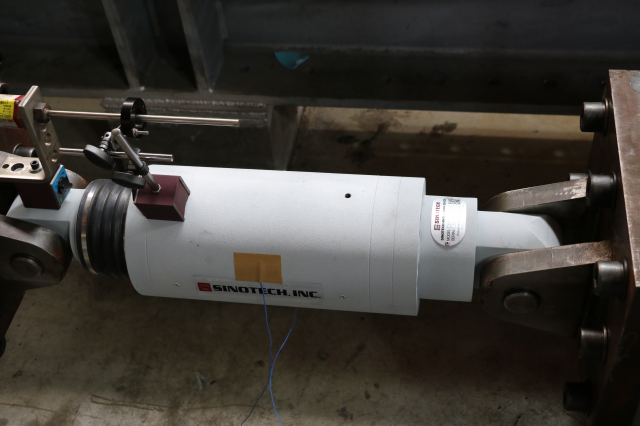 Sinotech Inc.'s shock transmission unit provides the structures at two ends with extra dynamic binding, able to create rigid link and latching force when structure is bearing greater than the service load, effectively transmits the impact among the structure. 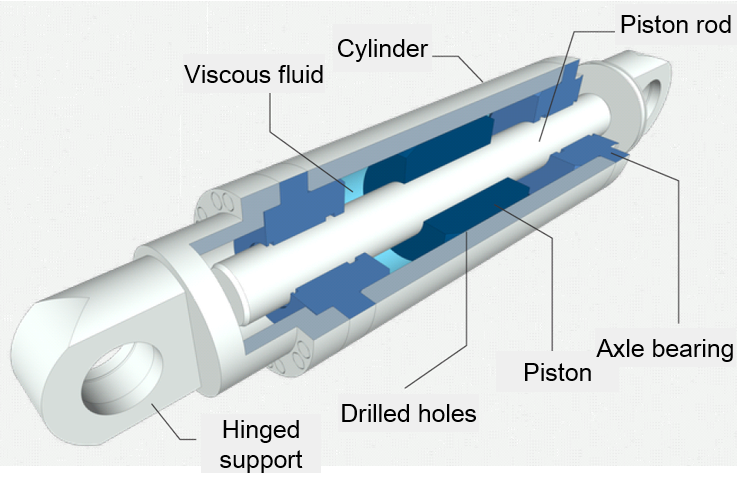 Low-velocity load: when structure is under low-velocity load (service load, temperature load, etc.) STU will only provide under 10% of the designed force and is negligible for actual structural analysis. Dynamic load: when structure under dynamic load (earthquake, wind, train moving, etc.) 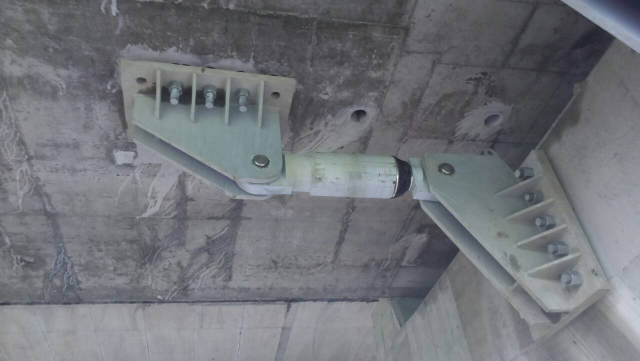 STU instantly provides the designed force to lock structures at the two ends and effectively change overall structural bearing behaviors. High quality: verified by hydraulic and overloading, excellent quality with long lasting stable performance without oil leak. 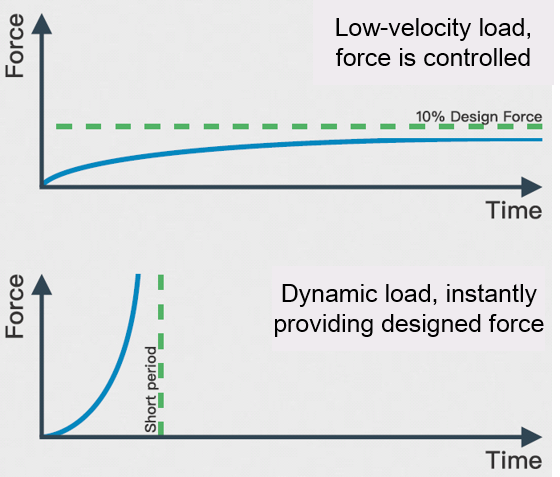 Low impact: when external force does not reach the locking velocity, all forces are less than 10% of the. Our STU product has passed AASHTO tests and has been certified by TAF laboratory, guaranteed to meet the designed effectiveness.